Is Korean Cosmetic Brand One O Seven is the new Brand to Watch For? Our Skin Says –YES! While on a hunt for a host of trending new beauty products, MyTopFace enlisted some of our top beauty experts to find some of the best products to review and share their experiences. One of the notable products our experts discovered was the 107 ONEOSEVEN Full of Moist set, and now also available at Nordstrom. 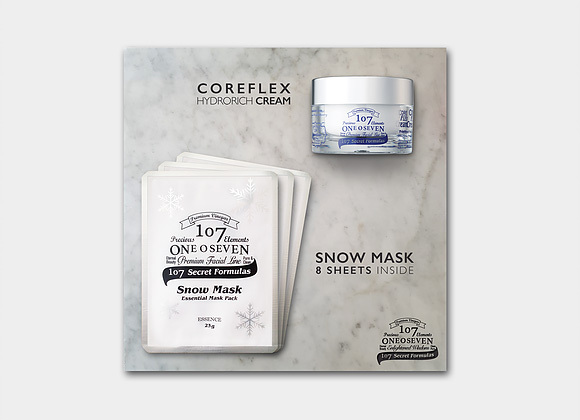 The ONEOSEVEN Full of Moist Set includes the 50mg COREFLEX Hydro Rich Cream and the 23g Snow Mask Pack that comes in a box of 8 sheets. Because this is a Korean company our expert wanted to research more about the company and the products it provided and was pleased to find out that the owner, Okran Chung is an experienced pharmacist and also runs the biggest naturally fermented vinegar brewery in Korea. She discovered how naturally fermented vinegar can help to cure troubled skin and diminish skin aging. (Interesting!) She put a great effort into researching how it could be produced as a cosmetic product. In the process of research and development, she discovered that specially aged vinegar with a variety of over twenty oriental herbs optimally produces a great amount of essential amino acids. She then successfully produced a host of cosmetic skincare systems that help the skin to be purified and feel rejuvenated. The company name ONEOSEVEN derives from one hundred and seven different secret formulas. The company has 107 different formulas that have been kept secret for over 35 generations. They seem to be very well informed of the ancient Korean herbs and formulas that help keep skin tight and firm! 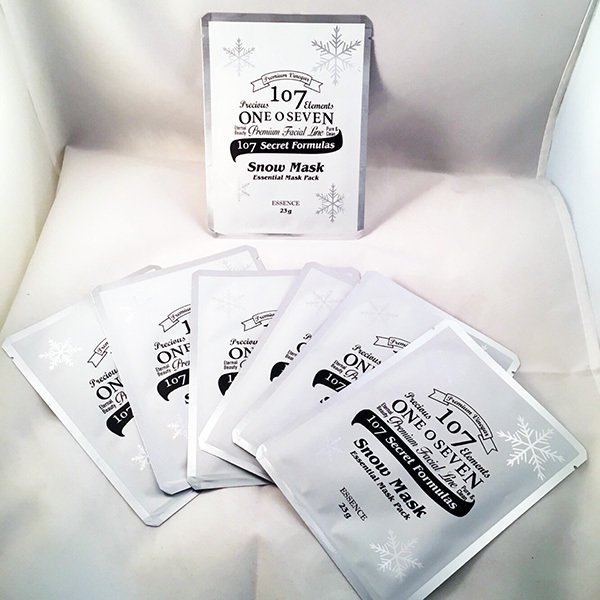 The 107 Snow Mask is an 8-day skin brightening and toning mask treatment. It is a white package that contains eight individually wrapped masks soaked in an aged vinegar serum. Upon First look, the packaging is of very high quality and is very clean and simplistic, yet still very attractive. The 107 Snow Mask comes with 23g of product saturated in a disposable cloth mask. It comes in a box of eight sheets for $20.00. The snow mask pack creates a powerful brightening effect and visibly smoother skin that you can see and feel. It will also give you a healthy and even looking complexion. For a more cooling effect, you can refrigerate before use! 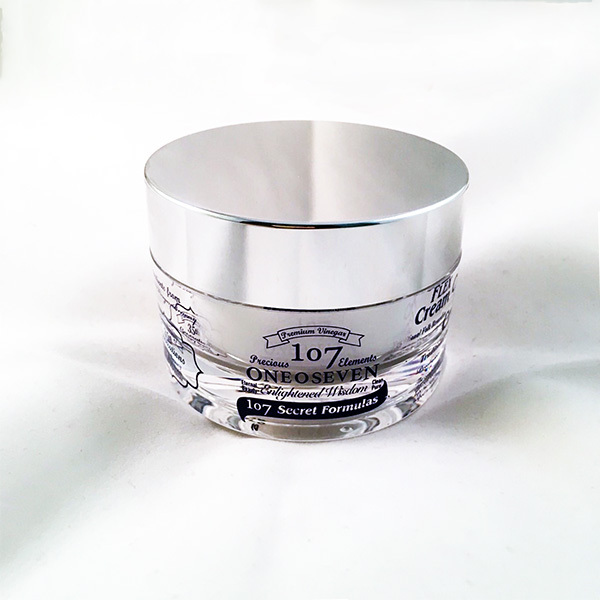 107 CoreFlex Hydro Rich Cream is a cream moisturizer that arrives in a very attractive clear jar and silver lid. According to the website, 107 Core Flex cream has Moroheiya which has Hyalurone B that calms and delivers intensive hydration. It is formulated with squalene and natural oil that recharges and moisturizes the skin. It also has naturally fermented vinegar, red ginseng, pomegranate, and soy milk ingredients that will make skin looks and feels stronger and healthier both inside and out. The 107 Core Flex Hydro Rich Cream comes in a 50g size and runs for about $48 – $52. It’s super rich so a little goes a very long way. It also has a shelf life of up to three years which is amazing when you compare it to the price. Our MyTopFace Beauty expert used the 107 Snow Mask after a deep and exfoliating clean and toning. When she placed the mask on her face it was instantly very cooling and refreshing! She literally felt her skin absorbing all the product in the mask! After 15 minutes of wear, the remaining serum was patted into the skin and after 2 minutes the skin was left feeling very rejuvenated and bright! Following the mask, we applied the Hydrating Cream, which was a great follow up product! A little definitely goes a long way, especially in the warm weathers. This product applied very smoothly to the skin and was extremely absorbent. Again, it is important to use a very little bit of product to avoid oversaturating the skin with product. This cream delivered a naturally dewy glow and makes the skin look extremely radiant! Both products have a very light floral scent to it, which is great for those who are sensitive to smell, or just don’t appreciate a strong fragrance to their beauty products. Its creamy rich texture makes it very easy and quick to apply. – A little goes a long way, so you’re sure to get your money worth! -Very rich cream so very little is necessary for the summer months. With that said it is definitely the perfect texture for the fall/winter. Our MyTopFace expert determined that these products worked very well together as well as with her other product regimens. She especially loves the way her skin feels after use and feels that is is very easy to tell that she will be moisturized throughout the day! Her makeup applied evenly and smoothly after moisturizing and surprisingly she used a lot less product following this mask and cream formula. That is one telltale sign that the skin is dehydrated, as it tends to absorb a lot more product than usual. This hydrating cream is not recommended for oily or non-absorbent skin types, however, the mask is suitable for all skin types. If our expert had to rate this product duo, she’d give it an 8.5 for the instant hydration after one use, as well as the smooth application and fast absorption. This is definitely a must buy if you’re seeking a regimen that promotes healthy, even and hydrated skin. This is also a must buy for the beauty that deals with a skin type that falls within the ranges of normal to dry. As this is an eight-day mask regimen, our Expert is excited to continue the hydration process throughout the days and will continue to update the reviews as she progresses. Until then, check out some of other MyTopFace reviews of products from the brand!